We have entered the month of June already. It looks like we had just a little bit of rain during the night. We are really in need of rain! Last night we watered the garden, as it was getting really dry. Everything is coming up really well. 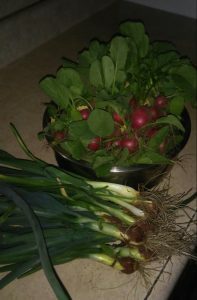 We are still enjoying radishes, green onions and lettuce from our first planting earlier this spring. 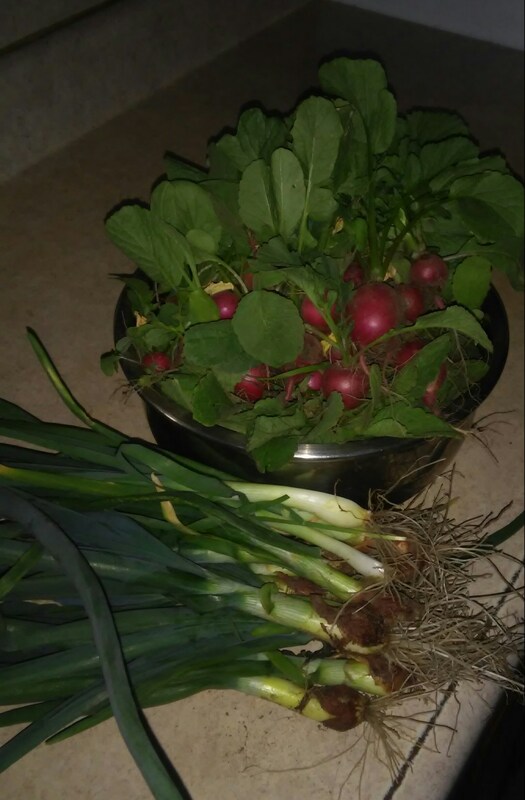 The Eichers’ garden is still yielding green onions and radishes from the first spring planting. We had a nice three-day weekend. A lot of fishing was done. On Friday evening some went fishing on the lake, and then they went again Saturday and Monday. Timothy and Elizabeth went to church at his sister’s house in another church district. We kept their dogs, Izzy and Crystal, here while they were gone. Crystal doesn’t like to be separated from Elizabeth, but Izzy loves staying here. She will go hide when she knows they are leaving for home! Saturday we had a short visit from sister Liz, Levi and family. Their daughter Elizabeth and Samuel and baby LaRose were also along, as was their daughter Rosa’s special friend, Menno. Joe’s sister Salome and Morris are also first-time grandparents now. Their daughter Katie Edna and Ben had a son named Benjamin. Joe went to visit them while we were at niece Lovina’s wedding. I was a cook so I didn’t go with Joe. Hopefully I’ll get to meet little Benjamin soon—maybe at the family gathering in July. Joe’s sister Christine and Jake are planning to have all of Joe’s family there on July 2. They live about three hours north of here. We are looking forward to seeing everyone again. It’s been awhile since we’ve seen some of the family. Hope everyone will make it! It will be in her forthcoming cookbook! Here’s an early look! Combine rhubarb and water and cook until rhubarb is soft, about 25 minutes. Drain, discarding rhubarb and add the rest of the ingredients to the juice. Stir until the sugar is dissolved. Freeze or can according to current USDA Canning Regulations. Can be served just as it is or you can add a clear soda or mix with pineapple juice.